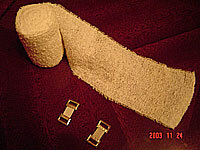 Cotton Stretch Bandage consists of characteristic fabric of plain weave. The warp threads are of singles cotton threads with a count not finer than 59 tex and of twofold cotton threads with a count, after crepe twisting, not finer than 59 tex, each containing not less than 21 folding turns per cm. 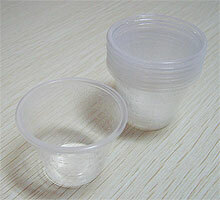 The weft threads are of singles cotton thread with a count not finer than 29 tex. The warp threads are arranged one twofold thread S-twist, one singles thread, one twofold thread Z-twist, one singles thread, repeated, together with two twofold binding threads at each cut edge. The fabric is clean and reasonably free from weaving defects and contains not more than traces of leaf residue, seed coat and other impurities. 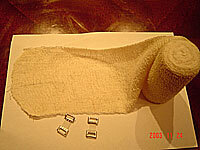 Crepe Bandage consists of characteristic fabric of plain weave. The warp threads are of wool, with a count not finer than 30 tex and not coarser than 35 tex and of twofold cotton threads with a count, after crepe twisting, not finer than 59 tex, each containing not less than 21 folding turns per cm. The weft threads are of singles cotton thread with a count not finer than 30 tex.